Frustrated by the fickle easterly flow gracing our fair shores for over a week now, locals and visitors alike have been forced to exercise some creativity in their flight planning. Or just forced to exercise - we often do more hiking than flying on days like this. We do our best to mobilize a widespread recon force to assess conditions on all sides of the island, and even then only a lucky few make it into the air for a brief window on a given day. After suffering scratchy sledders and hikes down from launch for two straight days, I walked into the Greek Marina on Saturday feeling desperate and dejected. There I found a dozen or more pilots lounging contentedly around a long table laden with cold beverages and the remains of a mediterranean feast, toasting their lucky early window of flying at Makapuu. My, how nice that must have been for them! Jeff tried to console me by describing just how epic his flight had been before the window had closed out there. And as you can imagine, that made me feel ever so much better. But even the frosty drink Jim graciously offered me couldn't cool my feverish desire to soar on the tantalizing but tricky easterly breeze. Tantalizing - now what does that make me think of? Before heading to Makapuu, Berndt had checked out Tantalus earlier in the day and called it the typical tease up there, probably not soarable. So I had put it out of my mind. Until now. Suddenly I was convinced that it must be glassing off perfectly at this moment, just from the strength of my desire for it. I jumped up from my chair and declared with all the authority I could muster that the Tantalus glass off was working. For the benefit of the many out of town pilots at the table, I added that the Tantalus glass off was the best flight our island has to offer. That may have been a slight exaggeration, but at that point I was already strenuously exercising my creative powers. I jumped in the car and raced off towards Tantalus. Suddenly I was visited by a few second thoughts. I really had no idea if the direction or strength were right. And perhaps it was too late for a glass off, almost 5 pm. It could very likely be pouring rain up there. If anyone actually followed me over there I would feel terrible about just making it all up. But I focused my willpower on soarable conditions, held my course and sped up. Even as fast as I was driving, some maniac in a shiny new red Prius kept cutting me off and actually beat me up there. It was Berndt! We ran out to the lookout together and were amazed to feel a moderate steady breeze, although it was quite cross out of the valley, more east than I am used to it. Nevertheless we threw our wings out and kited them to test the airflow. Neither of us was quite ready to call it launchable, but then Jorge showed up and hucked off first. He had no trouble staying up, and immediately started wanging his glider around above launch. Berndt and I quickly joined him, as did many others who had followed us from the Greek Marina feast. It was probably the latest I've ever flown up there, the last hour of the day before sunset. The clouds had built up into a solid dark blanket over the valley and also above the ridge, but the easterly flow was steady and unremitting. Probably not a glass off after all, just a genuine easterly breeze, smooth and sweet and unperturbed by daytime heating. A crowd grew at the lookout as people rushed up the mountain to get a closer look at the crazy parasailors. Some kind of skinny supermodel photo shoot was going on up there as we were launching and toplanding, and it looked like the poor photographer was trying to get shots without gliders in them. We didn't make that very easy, sorry! I flew three times, mostly enjoying the process of launching, winging it around a bit, and toplanding. Alaska Jack flew into the back and soon returned after barely escaping being sucked up by the monster cloud over the valley. Visitors Andy and Cherie joined Jorge under their own acro wings. Joey mustered the courage for his first ever Tantalus flight, followed by Reaper for his millionth flight up there. Thom and Jim made the conservative decision to sit this one out, never a bad decision. Thanks to both of them and Tommy for their help with the launches. And thanks to Jim for the post-flight drink. Afterwards we all went to Thom and Donna's for a barbecue. Scrappy was waiting there, inconsolably sore at us for not calling him. He'd missed the Makapuu window just like I had, but instead of stupidly hiking up Cactus like me, he'd given up earlier and was the first one at Thom's house after the idea of the barbecue was first suggested. Again another epic tale from the illustrious Leader of the Flying Monkey Clan. If there is any wonder why Alex is the President....this proves it....people will follow him anywhere as long as it is not a "guarantee". Hope you guys get another one today !!!! So when it's too east now, late in the day; Is TAN a good possibility? Rich, Tantalus is a good possibility for a typical advanced pilot anytime they are looking for some thermalling fun with very limited landing options - many pilots have jumped the gun and flown it before they were officially certified as advanced, but if anyone asks me, I always tell them it's an advanced site, because it really is. I would definitely recommend that pilots learn to thermal on light days at Makapuu and any day at Nanakuli, and do some downrange flying at Kahana, learning to select and approach a variety of outlanding sites, before tackling Tantalus. 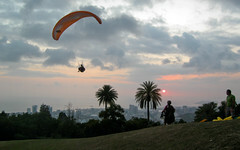 Every flight at Tantalus could be considered an XC flight, even if you manage to land back on top. Mad Dog has flown for 13 years, holds Oahu XC records, flies the Alps, Nepal, etc, and he decided not to fly Tantalus this afternoon even though there were already wings in the air. He said he's never flown here even after years of watching his buddies do it. One reason is because he remembers the days when the DLNR chased the guys down to give them tickets. But also he doesn't want to take the chance of bombing out to the road below. I think Don hasn't flown there either, for the same reason. I don't want to take the chance of a road landing either, but so far I've been lucky in choosing days when I didn't have to. But even if you don't sink out, the top landing is not always that easy. Ask Frank how hard he had to work to set it up today, or Joey the other day! We are still learning what conditions work up there - Jorge thinks it works on more days than we suspect. We don't generally think of it as a site that takes easterly flow, but the last few days have started to change my mind about that. If it's light enough, it seems like it can work very nicely, not just in the afternoon, but all day long. 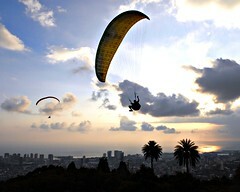 As a new pilot it is always just a good idea to go watch the launches and landings at Tantalus many times. Joey got lucky with a perfect day and I watched Frank and listened to the radio in Waikiki and he was having fun getting down to top land. Again a good place to go watch and learn, don't even get your bag out unless your an advance pilot a cooler will be perfect. Actually Thom, I'd say "get your bag out and keep an eye on it!!" The car thieves at the Tantalus lookout are brazen. More than anywhere else we fly, I'm always concerned about my car when I'm up there. But, as to your intended point, you're dead on. I like to see at least 2 or 3 people go ahead of me at Tantalus. If they never dip below launch, that looks like a no-brainer day. "Some kind of skinny supermodel photo shoot was going on up there as we were launching and toplanding"
I'm glad your creative and enthusiastic powers were rewarded!